Photography by George Sass Sr.
Intrepid voyagers brave the Bering Sea on a 65-foot motoryacht in search of the legendary unspoiled beauty for which Alaska is known. As the twin-engine turboprop broke through the clouds on its approach to Sand Point, Alaska, the scene below revealed a barren, isolated land dotted with a few buildings and hundreds of fishing boats. 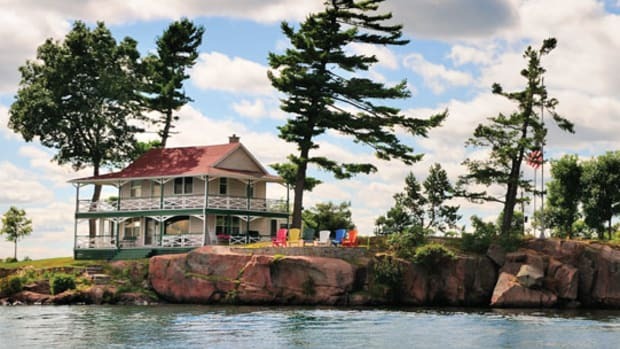 Nearly everything was a shade of gray—the water, the land, and the sky. On the ground everything was dripping wet—the runway, the roads, even the people. There was an inescapable chill, a byproduct of the ever-present Alaskan rain and wind. 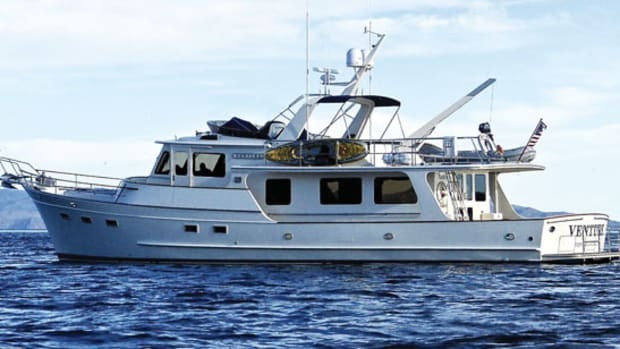 I had arrived on Popof Island, part of the Shumagin chain in Southwest Alaska, where I was to meet up with founder of Fleming Yachts, Tony Fleming aboard Venture, his Fleming 65. Two months earlier, Fleming and his captain, Chris Conklin, departed Vancouver Island on a voyage north with stops in Juneau, Cordova, and Kodiak. 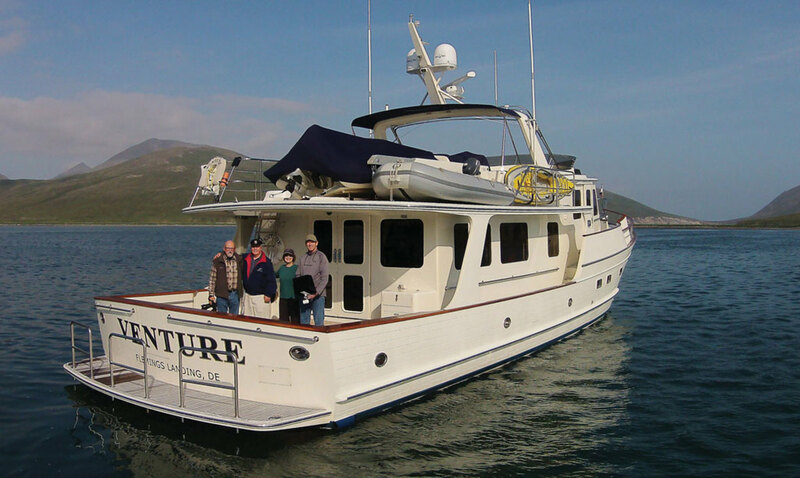 Venture, now ten years old, is Hull No. 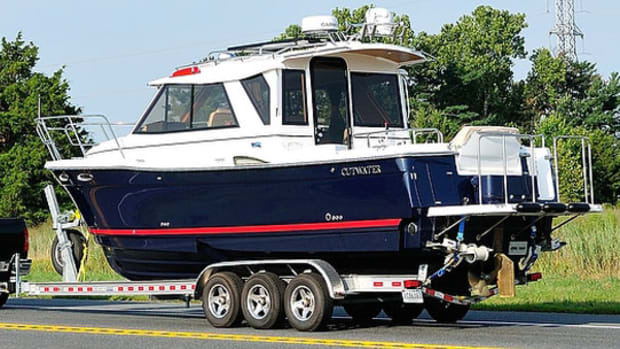 1 of the Fleming 65 series and continues to serve as a test bed for Fleming Yachts. Since retiring from his boatbuilding days, Fleming has put more than 50,000 nautical miles on Venture, extending his personal horizons while providing feedback to those now in charge of developing and building new Flemings. 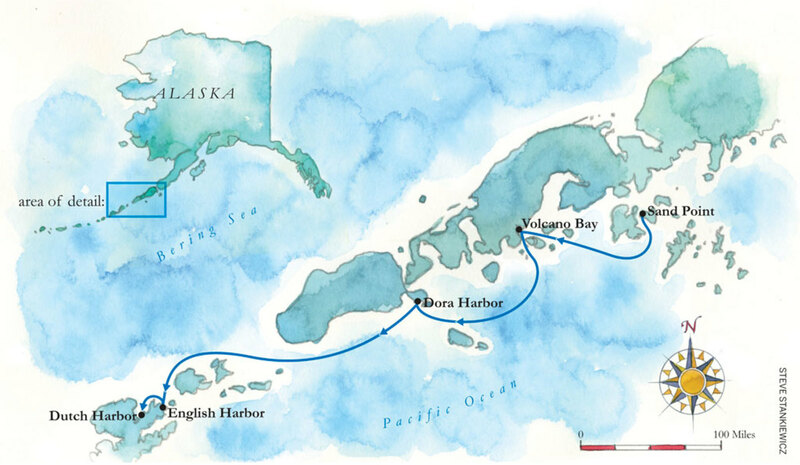 The goal of this voyage was to explore Alaska’s remote Aleutian Islands, eventually reaching the Bering Sea’s fishing port of Dutch Harbor, known to many armchair fishermen by the TV series, Deadliest Catch. Venture was launched in late 2004. 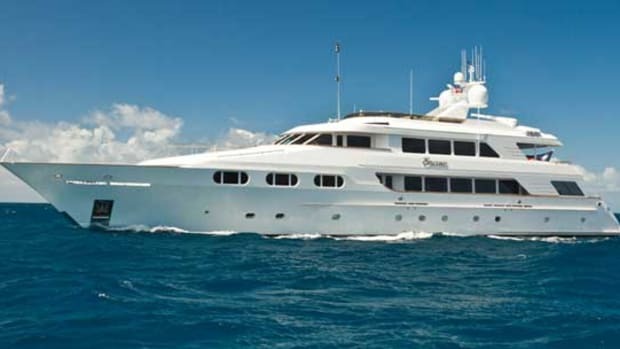 She serves as a Fleming test bed for new equipment and ideas and has undergone a continuous series of upgrades. 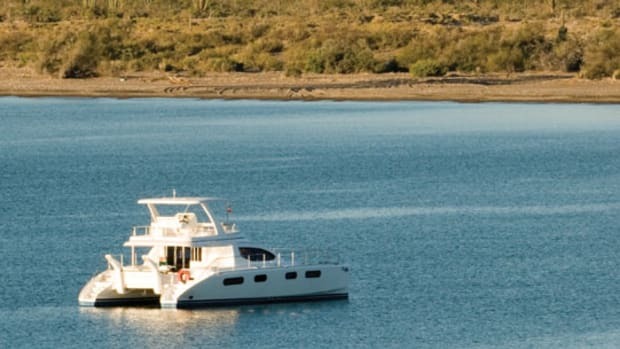 After her first 8,000 miles, Tony Fleming opted to repower her with new 800-horsepower MAN common-rail diesel engines, and at the same time he made changes to the generator, water-heating system, and electronics. Many of the changes, including the MAN engine upgrade, have been incorporated in the production boats. Later, a Sea Torque Bolt-On Shaft System (BOSS) was retrofitted and is now standard on most Fleming models. This totally enclosed, oil-filled shaft and thrust assembly reduces both vibration and shaft drag. In the winter of 2014, an all-new Furuno electronics system replaced the original system. Today, Venture has more than 50,000 miles under her keel and shows no sign of slowing down. Asked about his reason for choosing this particular route, where few private yachts dare to go, he explains, “My reasons are primarily to visit places of interest that are impossible or difficult to get to by conventional transport.” Based on the number of flights and hours it took to join Venture, Fleming seemed to be pushing the envelope. Indeed, the Shumagins and Aleutians are not exactly tourist destinations. In fact, very few Alaskan cruise ships visit these remote islands. As I soon discovered, however, Sand Point’s notoriously “clousy” weather was more than compensated for by the warmth and generosity of its residents. Waiting for my baggage and wondering how I was going to haul everything to where Venture was docked, I was approached by someone who introduced himself as Robbie, the manager of the town’s general store. “With all your camera bags, I figure you must be George. Tony mentioned you might need a lift to the boat,” Robbie greeted me with a hearty handshake. With less than 1,000 residents, most of whom are commercial fishermen or workers in the seafood packing plant, I stood out from the crowd. But before I hopped into Robbie’s van, another fellow introduced himself as Glen Gardner, mayor of Sand Point. He handed me a wonderful, illustrated book about the history of Sand Point and its Native American heritage. “Let me know if you need anything or have any questions about Sand Point,” offered the mayor. Spotting Venture in the “small boat” harbor was easy, as it was the only pleasure boat except for a derelict 40-foot sailboat among the salty fishing fleet. The crews were busy getting their nets ready for the opening of salmon season, and as I walked the docks and read the book given to me by the mayor, I began to learn the difference between a stern picker, bow picker, set netter, and purse seiner. Odd-looking, stubby aluminum skiffs used to spread nets were carried on the sterns of their mother ships, and miles of nets, floats, and line were piled high on the big boats’ aft decks. The crews were a mixture of young and old, many of whom were native Alaskans. Soon, the tightly regulated fishing window would be open for 88 hours, after which there would be a three-day rest period followed by additional 88-hour windows and rest periods. It was hard, dangerous work, but based on the shipshape condition of the fleet and the cheerful mood of the captains, there was good money to be made. After waiting a day for a front to pass, we departed Sand Point and headed southwest to Volcano Bay, a distance of 60 miles. While it appeared the surrounding mountains would provide protection from the wind, they instead created a funnel effect resulting in 40 knots with higher gusts throughout the night. We were alone in this large bay except for a brown bear patrolling the distant shore. Even with 200 feet of chain and a sticky bottom 45 feet below us, our anchor track showed some movement the next morning. Upon first light, dramatic cloud formations appeared that looked like alien ships coming in for a landing. With no other boats in sight and with the wind still howling, it felt as if we had entered a lost world. 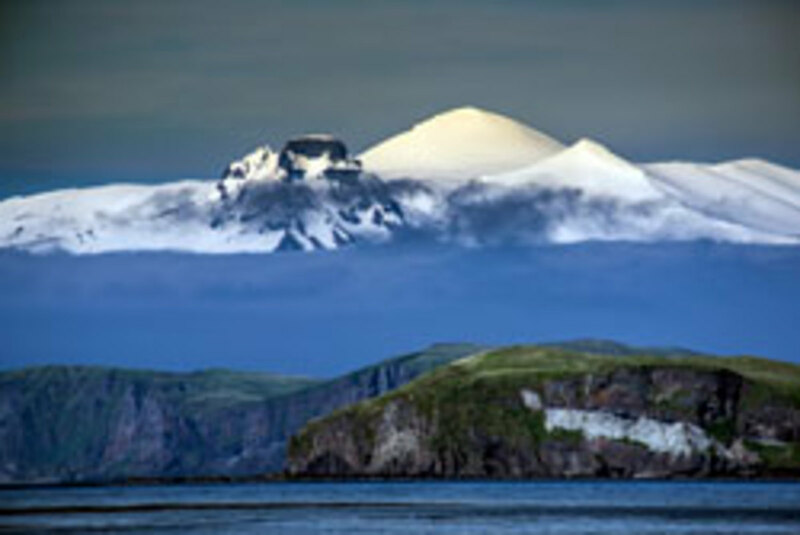 Another 60 miles brought us past Unimak Island with a daunting view of three volcanoes—Roundtop, Isanotski, and Shishaldin, the latter of which is “somewhat active.” At 9,373 feet, it is the highest peak in the Aleutians, and while the last confirmed eruption was in 1999, it continues to display seismic activity by puffing steam every few minutes. We sought shelter from large ocean swells in the inner anchorage of Dora Harbor on the southwestern side of Unimak Island’s Ikatan peninsula. Lying a few miles southwest of False Pass, we were now officially in the Aleutians. The sun had finally come out, and we were able to more clearly see the magnificent scenery before us. At this latitude, summer daylight lasts until 11 p.m. Throughout the early evening two dozen small fishing boats anchored nearby, and a number of them approached us to ask what we were doing up here, so far from civilization. Friendly, curious, and generous, the fishermen offered us free salmon even after admitting it had not been a particularly productive day. Thanks to their generosity, I was kept busy filleting several of these wonderfully fresh, healthy fish. We awoke at 5:00 a.m. the next day to a nearly empty anchorage as most of the fishing boats had already gone. Conklin had been diligent about checking the weather, and we took advantage of a favorable forecast to head through Unimak Pass, leaving the Pacific Ocean and entering the notorious Bering Sea. 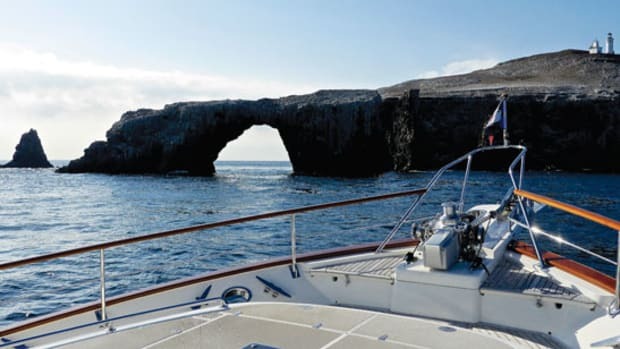 Imagining the 20-foot seas and 60-knot winds we had seen on the Deadliest Catch series, we were pleasantly surprised by the benign beauty that greeted us. The early morning conditions were perfect—3- to 4-four-foot seas, 15 knots of wind, and blue, sunny skies. But as the day wore on, the wind and seas built. As we passed between islands, the funnel effect returned and we watched a steady 35 knots of wind blowing the tops off 8-foot seas. Freighters, fishing boats, “tenders” that stored the daily catch, and tugs pulling barges stacked high with refrigerated containers were coming and going, and we sensed we were nearing civilization. After 12 hours and 125 miles, we reached the protection of beautiful English Bay on the northeastern tip of Unalaska Island, just 20 miles from Dutch Harbor. Surrounded by low mountains that appeared to be sprayed with green velvet randomly torn by a series of cascading waterfalls, we sensed how very special—perhaps sacred—this spot was. Behind us in the distance was snow-capped Akutan Peak (4,275 feet) adding to the spectacular beauty of this magical anchorage. Our excitement and anticipation began to build as we neared Dutch Harbor the next morning. Suddenly our cell phones came alive with chirping messages and beeping e-mails that had been undeliverable for more than a week. Venture’s AIS system lit up with targets entering and leaving the busy port. 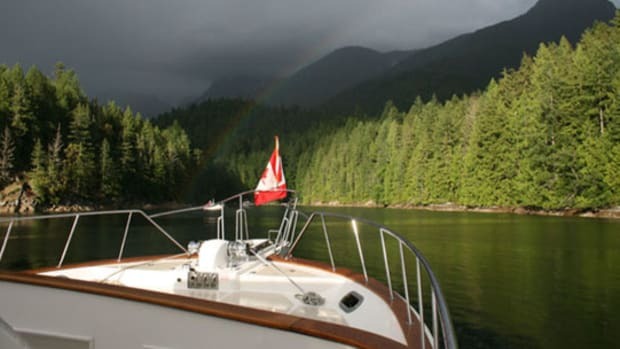 A VHF call to the harbormaster was answered with a quick response, and after explaining that we were on a private yacht we were directed to floating docks adjacent to Expedition Island Park. 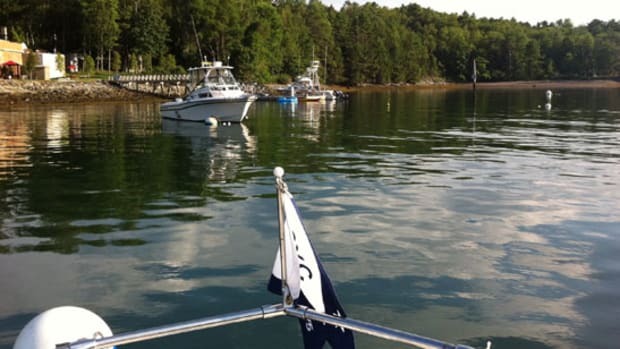 The harbormaster on duty greeted us, but Venture would not fit in the available space among the small fishing boats, odd liveaboards, and seriously equipped sailboats. We were redirected to the newer Carl E. Moses (CEM) Boat Harbor, requiring us to circumnavigate Amaknak Island and reenter Dutch Harbor through its back door. The modern facility was equipped to handle commercial vessels up to 150 feet, and so we were now among the big boys. Docked next to a rugged 100-foot tug and being the only private yacht in the basin, we felt a bit out of place. Even Venture’s 50-amp power cord was dwarfed by CEM’s power pedestals that accepted only 100-amp connectors. Luckily Venture’s generator would provide what power we needed. The harbormaster kindly drove us to the airport, where we rented a small SUV, and on the way he showed us the town’s main points of interest including a major grocery store, hotel, restaurants, a museum, and a large general store that sells groceries, hardware, appliances, and clothing. We had found civilization in the Aleutians. Taking advantage of the unusually clear, sunny skies, we drove to the top of Ballyhoo Mountain (1,634 feet) to see the ruins of Fort Schwatka and view the vast harbor below. The remnants of underground gun emplacements were a reminder of the part the Aleutians played in World War II. In fact, Ballyhoo Mountain was the site of a major artillery position attacked twice by the Japanese in 1942. The Americans later invaded the islands of Attu and Kiska, ending the Japanese occupation of the Aleutians. Today Dutch Harbor, a deep-draft, ice-free port, ranks number one in the nation for pounds of seafood landed. The bountiful Bering Sea fills the town’s processing plants with pollock, Pacific cod, halibut, crab, sole, rockfish, herring, and salmon, averaging between 700 and 900 million pounds of fish and shellfish per year. As such, the economy of Dutch Harbor is healthy, even booming. Refrigerated containers lining the shore are stacked sky high packed with seafood waiting to be shipped to markets around the world. We had the pleasure of meeting with Shirley Marquardt, the mayor of the City of Unalaska (Dutch Harbor and Unalaska are used interchangeably and refer to the area encompassing all of Amaknak Island and the northeastern end of Unalaska Island). An attractive, energetic woman, Marquardt might first appear to be an enigma in such a rough and tumble, male-dominated world. But one quickly discovers her take-charge personality coupled with a profound knowledge of Alaska’s fisheries industry have earned her the respect of her constituents. Marquardt shared her optimistic view of Dutch Harbor with us, explaining, “In addition to our fisheries industry, we’re becoming a major staging area for Shell Oil’s exploration of the Beaufort and Chukchi Seas, 2,000 miles north of here. We’re the closest ice-free port to where they are exploring, and we have the infrastructure to support their fleet.” Marquardt also pointed out that unlike other parts of Alaska, there are no bears on the island, making it safe to live and work here. 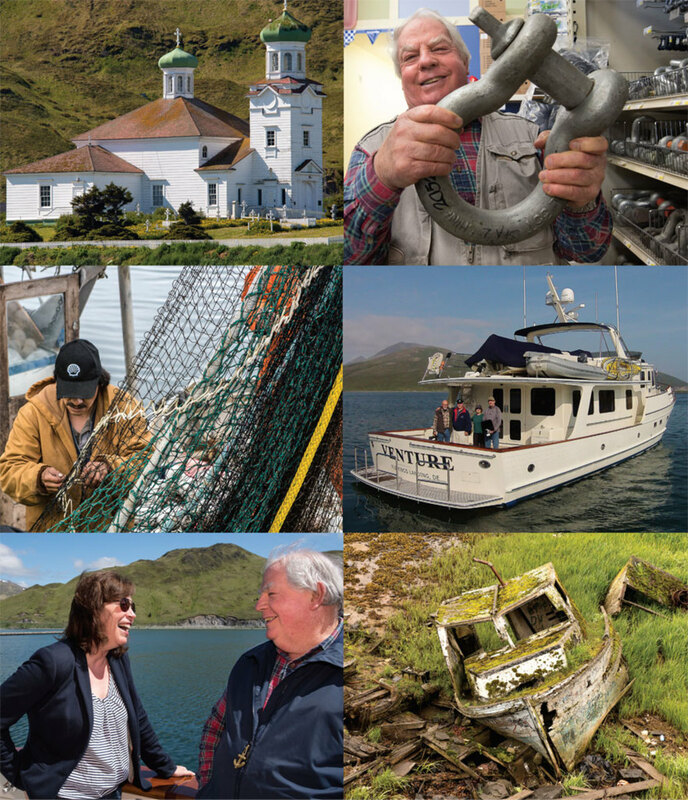 While the thrilling scenes and colorful characters of Deadliest Catch have introduced Dutch Harbor to a worldwide TV audience, Marquardt likes to emphasize the more attractive, economically sound reasons for living and working here. 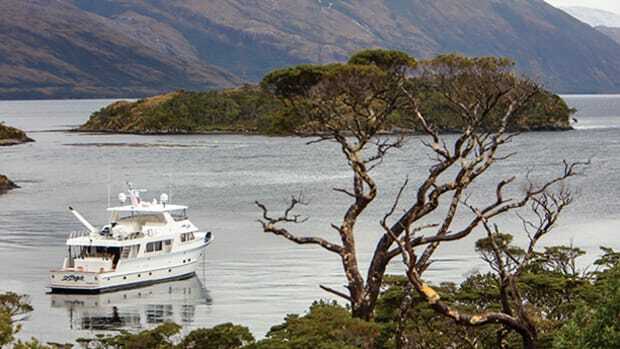 For serious cruisers with seaworthy, bluewater yachts, Dutch Harbor’s regional airport, modern hotel, decent restaurants, top-notch marine services, and availability of supplies and provisions help make it a rewarding destination. 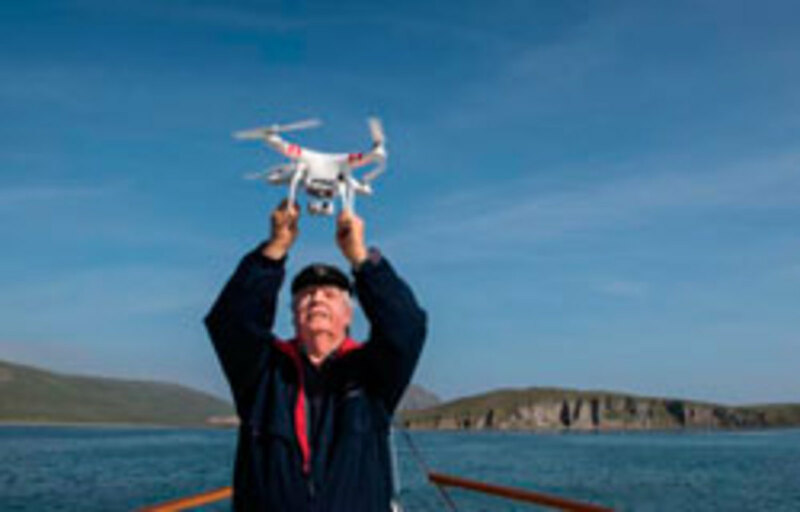 And while the spectacular scenery and uncrowded anchorages might be the compelling reasons to consider cruising these remote islands of Southwest Alaska, the welcoming generosity and fascinating stories of the people who live and work here are what impressed the crew of Venture the most.